The Discrete Micromechanics and Fracture group carries out multi-disciplinary research into the response of advanced engineering materials to various types of external loading and environmental conditions. The main aim of the group is the development of advanced numerical methods and their application to describe deformation and failure processes on the microstructural scale. Experimental tools are used to generate reliable input data and to validate the numerical methods. Numerical simulation of fatigue behavior using the Crystal Plasticity-Finite element method (CP-FEM). (1) Localization of deformation under cyclic loading (2) Crack nucleation due to accumulation of plastic slip (3) Short fatigue cracks grow individually (4) Coalescence of several cracks through multiple grains.Figure 1: Numerical simulation of fatigue behavior using the Crystal Plasticity-Finite element method (CP-FEM). 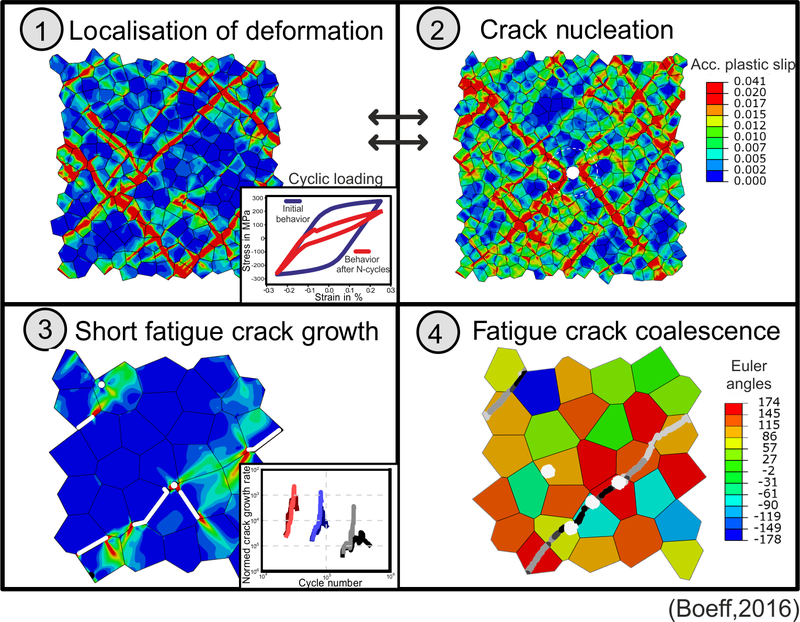 (1) Localization of deformation under cyclic loading (2) Crack nucleation due to accumulation of plastic slip (3) Short fatigue cracks grow individually (4) Coalescence of several cracks through multiple grains. Our analysis of localized deformation, evolution of damage as well as failure initiation and development allows the prediction of the properties, performance, behavior under loading, and structural integrity of modern materials and the components made from them. 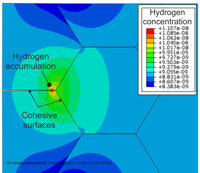 A major emphasis of this group is the understanding of how the internal microstructure of an engineering material influences its response under application in the field. Investigations are carried out based on micromechanical principles using Crystal Plasticity-Finite element method (CP-FEM) to describe their plasticity, fracture, damage and fatigue behavior. 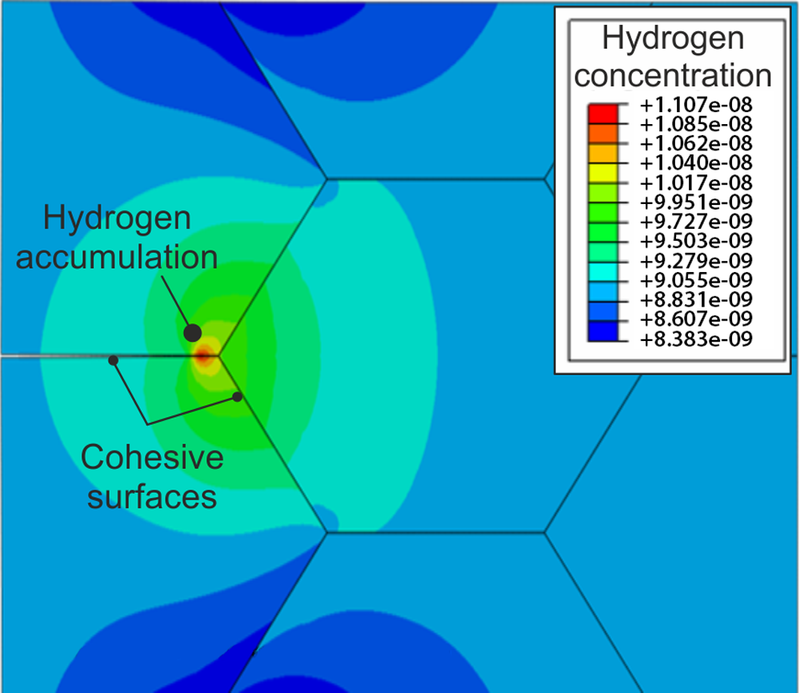 The influence of hydrogen environment on the fracture behavior of the materials is also investigated. The materials we are currently working with are steels and alloys, aluminum and composites. The research in this group is strongly interlinked with other research activities at ICAMS on modeling of microstructures and atomic description of fracture.